Welcome to the Revealing Errors weblog. Our goal is to reveal errors that reveal the technology around us to learn how technology affects our lives. This introduction is adapted from the introduction to the Revealing Errors article published as the featured article in the Error issue (10.5) of the peer-reviewed Media/Culture Journal from the University of Melbourne. Please read the article for more in depth treatment of the subject. In The World Is Not a Desktop, Marc Weisner, the principal scientist and manager of the computer science laboratory at Xerox PARC, stated that, “a good tool is an invisible tool.” Weisner cited eyeglasses as an ideal technology because with spectacles, he argued, “you look at the world, not the eyeglasses.” Through repetition, and by design, technologies blend into our lives. While technologies, and communications technologies in particular, have a powerful mediating impact, many of the most pervasive effects are taken for granted by most users. When technology works smoothly, its nature and effects are invisible. But technologies do not always work smoothly. A tiny fracture or a smudge on a lens renders glasses quite visible to the wearer. 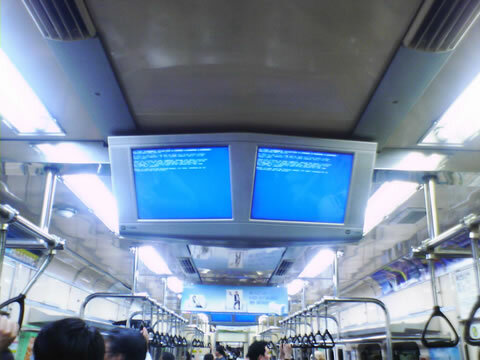 The Microsoft Windows “Blue Screen of Death” on subway in Seoul. Anyone who has seen a famous “Blue Screen of Death”—the iconic signal of a Microsoft Windows crash—on a public screen or terminal knows how errors can thrust the technical details of previously invisible systems into view. Nobody knows that their ATM runs Windows until the system crashes. Of course, the operating system chosen for a sign or bank machine has important implications for its users. Windows, or an alternative operating system, creates affordances and imposes limitations. Faced with a crashed ATM, a consumer might ask herself if, with its rampant viruses and security holes, she should really trust an ATM running Windows? Technologies make previously impossible actions possible and many actions easier. In the process, they frame and constrain possible actions. They mediate. Communication technologies allow users to communicate in new ways but constrain communication in the process. In a very fundamental way, communication technologies define what their users can say, to whom they say it, and how they can say it—and what, to whom, and how they cannot. Technology activists, like those at the Free Software Foundation (FSF) and the Electronic Frontier Foundation (EFF), understand the power, importance, and limitations of technology and technological mediation. Largely constituted by technical members, both organisations, like humanist scholars studying technology, have struggled to communicate their messages to a less-technical public. Before one can argue for the importance of individual control over who owns technology, as both FSF and EFF do, an audience must first appreciate the power and effect that their technology and its designers have. To understand the power that technology has on its users, users must first see the technology in question. Most users do not. Errors are under-appreciated and under-utilised in their ability to reveal technology around us. By painting a picture of how certain technologies facilitate certain mistakes, one can better show how technology mediates. By revealing errors, scholars and activists can reveal previously invisible technologies and their effects more generally. Errors can reveal technology—and its power and can do so in ways that users of technologies confront daily and understand intimately. This weblog is maintained by Benjamin Mako Hill, a social scientists, free/open source technology activist, software developer and consultant. This project is done as part of a Fellowship at the MIT Center for Future Civic Media. Contributions, both in terms of suggestions or pointers to revealing errors or in the form of full articles is graciously accepted. Please email mako@atdot.cc with any such suggestions.